E2MP is a European project financed by Erasmus + Programme established by five member partnership. ADICE – is a non-profit organisation from France aiming to actively support against discrimination and to facilitate the social inclusion of young persons with fewer opportunities: job seekers, migrants, and social disadvantaged persons by supporting their participation in national, European and international training and mobility programs. CESIE – is an European Centre of Studies and Initiatives, a non-profit, apolitical, and secular non-governmental organisation with member organizations in more than eight European countries. The organisation is divided into five departments which work together and manage activities in their specific fields: European Cooperation, International Cooperation, Mobility, Socio-cultural Promotion and Vocational Training. The head office can be found in the city centre of Palermo with other offices in India, Nepal and Senegal. CCW – is an approved training provider for; The Institute of Leadership and Management (i-l-m), in delivering vocational qualifications in Leadership & Management; The British Computer Society (BCS) in ICT training and Edexcel/Pearson in English language training working both with young people and people with fewer opportunities and managers. EFM – is an independent non-governmental and non-profit organization which aims to implement different projects for youngsters. The organization is both active at an international, European and national level. The general aim of EFM is to spread the impact of its projects beyond Poland’s border. EFM’s activities include workshops and trainings, international youth exchanges, European Voluntary Service, national and trans-national youth initiatives, conferences, seminars, job shadowing, study visits, feasibility visits, open air music events designed to effectively tackle the concerns of young people and the local communities, non-formal educational work camps for Polish youngsters. SophieDelebarre Council – is a consulting organisation based in La Madeleine (close to Lille) and specialized in consulting European projects engineering and support in the field of social innovation for the experiment, the construction and the transfer of methods and innovative tools which favor the social and professional inclusion of the most fragile public, in particular the young people. It works directly in management and animation of transnational partnership of projects or as external support for project leaders, either on missions of capitalization and modelling, or on missions of evaluation. The project was created to answer quotidian need related to the lack of project management skills among managers working with youth and especially with young people with fewer opportunities when preparing them to a mobility project. E2MP members are all experienced in managing European projects and preparing young people to departure, mentoring and evaluate them during and after there are back in their sending country. Their experience allowed them to understand that the need of good tools and methods of working with young people is essential for the Youth workers and for the success of a participant project. So, the project mainly aims to train the youth managers to correctly manage European mobility projects for young people. ‘The European Mobility Project Management Online Training ‘ – output lead by CCW – is meant to be an innovative tool (software online) which will present the tools, methods, systems, skills and knowledge to teach the youth workers/managers how to perfectly manage European mobility projects for young people. The result will be used by the youth workers who want to support young people in the construction, the preparation, the monitoring and the capitalization of their mobility projects. ‘Specific training session over Young people with fewer opportunities support’ – output lead by EFM – is a complementary tool which will provide the youth workers with skills and necessary knowledge to support young people with fewer opportunities (p. 7 – http://ec.europa.eu/youth/library/reports/inclusion-diversity-strategy_en.pdf) in the preparation, the monitoring and the capitalization of their European mobility project. The session will represent an additional guide meant to gather advice, practical information and interactive exercises to provide youth manager with deeper support, understanding and competencies helping them to better cope with potential problems when working with people with fewer opportunities. The aim of this output, as all the others, is to insure the success of their participant mobility project. ‘Evaluation and certification process in European Mobility project management for the Youth Workers’ – output lead by SophieDelebarre Conseil – is an IT tool meant to evaluate the youth workers after using the online training material. The evaluation will be mainly based on questionnaires and interactive exercises. The successful learners will receive a certificate of attendance of the online training. ‘Professional orientation and inclusion session guide for youth workers – output lead by CESIE – represents guidelines describing the methods, tools and framework for youth workers to support young people and young people with fewer opportunities after their return from the mobility project. The youth manager is to help the participant to evaluate their experience and to promote it in their future career. So the guidelines will made the youth workers aware about the necessary methods and skills they need to support their participants: methodologies about interviews, skills references, orientation, advice, Labour Market analysis, tools, etc. ‘Platform to capitalize and disseminate the European Mobility Project management training for youth workers’ – output lead by ADICE – is an online platform where all the previous described outputs will be uploaded for free use by youth workers in Europe. The output will be disseminated during a ‘Final dissemination event’ which will take place in Roubaix, France. All the output will be prepared, implemented, follow-up, disseminated and evaluated during the two year funding. The project was launched in May 2015, by the coordinating organisation, ADICE, in Roubaix and will end in April 2017. 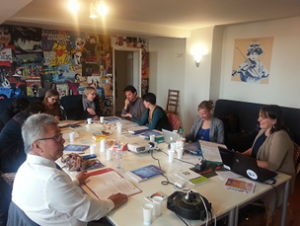 1st meeting – The first transnational project meeting took place in Roubaix, France and has been attended by the all partners. During the meeting, the coordinating organisation has generally presented the project, its target group and the budget, and made all the partnership members aware about the E2MP project objectives. The role and the responsibilities of each partner in the project has been clarified and a dissemination plan created. A first draft about the future content table of the online training was designed and the next steps for taking the first intellectual output forward were established. 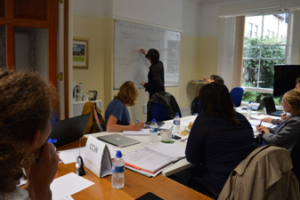 2nd meeting – The second transnational meeting of the project was hosted by CCW in Cardiff, UK. During the meeting each partnership member has presented his/her contribution on the output. Currently a first draft of the first intellectual output is created and new advancements are made on the second intellectual output. 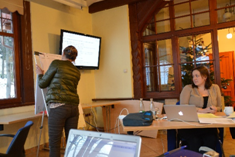 CCW has recently attended the third E2MP project meeting hosted by EFM in Poland. The meeting agenda has focused on discussions on the implementation of the first intellectual output – The European Mobility Project Management Online Training and the second intellectual output – Specific training session over young people with fewer opportunities, and on the preparation of the third output – Evaluation and certification process in European Mobility project management for the Youth Workers. The consortium are using different methodologies in order to provide the best results and help in the most efficient way the new youth managers working on Erasmus +, and especially the youth workers targeting to work with young people with fewer opportunities. The meeting gave the partnership the opportunity to make a step forward in the preparation and implementation of the outputs and to come with effective and innovative methods proposals. The training aims to increase the youth workers understanding about the Programme and about the EU tools to be used in the work with youth, as well as to train the user to take in consideration the most likely risks when working with youth and young people with fewer opportunities. The training aims to increase the users’ skills and to give young people a higher chance to participate in a mobility project while being prepared, mentored and followed-up by skilled and knowledgeable youth managers.